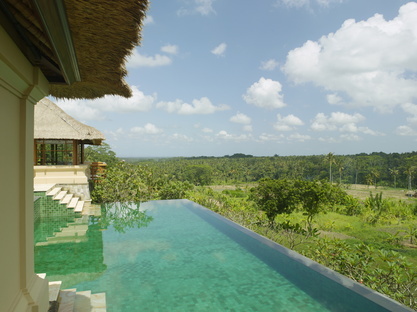 A sustainable holiday in a natural context of rare beauty is possible, in Bali, at Amandari. The second resort of the Aman group celebrates its 30th anniversary with lots of initiatives that underscore its commitment to the territory and the local culture. The legendary Bali, also known as the Island of the Gods, a kind of heaven on earth with a fertile land of rice paddies, holy mountains and pristine beaches first made its mark as a place of stunning beauty in the early 1900s. Here, in the middle of the lush nature and with the precise intent to preserve the original culture and spirit of the site, is where the second resort of the Aman group was built in 1989, called Amandari, or peaceful spirit. Perched above the verdant Ayung River Gorge outside the artists’ community of Ubud, this tranquil resort overlooks a natural forest and an emerald green cascade of rice paddies. It is architecturally reminiscent of a traditional Balinese village with an outdoor reception area designed according to the idea of a meeting place. Winding stone paths lead to the various resort amenities: the restaurant, the main swimming pool, the bar, the library, the health spa and the boutique as well as to the 30 suites, small huts with thatched roofs. Amandari is a natural, integral fit in Kedewatan, a village that retains the same traditions practised for centuries by the Balinese, who set great store by the family and happiness. So, an important part of staying in this resort, now as it always has been, is learning about and respecting the local culture. 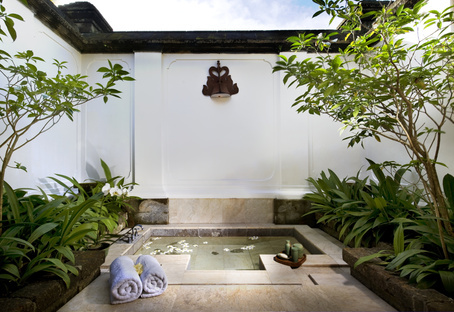 Guests here can discover the magic of this wondrous place, visiting rural villages full of artisans and hiking or cycling amongst the terraced rice paddies that form the backdrop in this part of Bali. A connection with the local population and its traditions that is typical of the Aman philosophy, where the concept of tourism centres on the wellbeing of the guest as much as it does on the people who live here. For this reason, the community of Kedewatan plays an important part for the Amandari resort, which takes an active role in the development of the village and its inhabitants. Many of the staff come from this village and some of them have worked at the resort since it first opened in 1989. Each month throughout 2019, children from Kedewatan school will be invited to Amandari for an educational tour of the hotel to learn about the various environmentally friendly initiatives undertaken by the resort. This includes composting, waste management, reforesting and farming the organic garden, to build their awareness of these practices. The Kesayan Ikang Papa Orphanage lies twenty minutes’ drive from Amandari and in 2019 the resort will host an art installation in its library, exhibiting 30 works of art created by the orphanage children. The artworks will be on sale and all proceeds will go to the orphanage as one of the many activities being organised to celebrate the resort's 30th anniversary, particularly with regard to the local community. Images: © Amanresorts Limited 1996-present. All Rights Reserved.